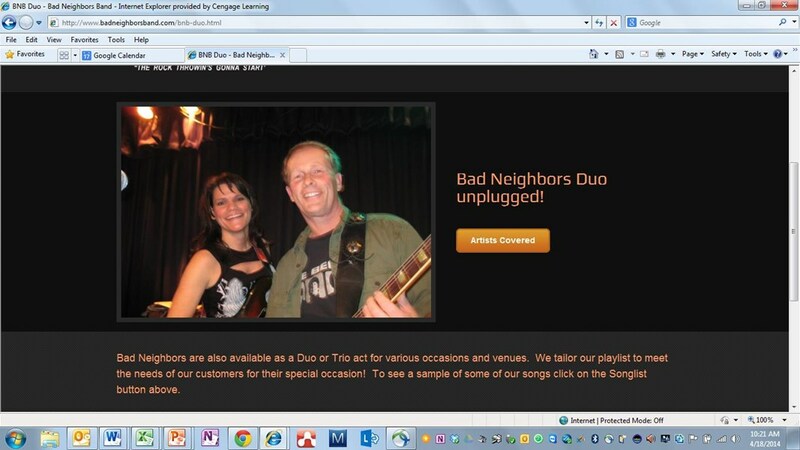 The Bad Neighbors Duo plays classic to contemporary songs. We cover a variety of artists and tailor our show to meet your needs for that special occasion! Some of the artists covered are: Etta James, Creedence Clearwater Revival, KT Tunstall, Tom Petty, Beatles, Motels Patsy Cline and beyond. We attempt to reach the widest audience by including songs from the 50's through today. Please note The Bad Neighbors Duo will also travel to Aurora, Hudson, Twinsburg, Macedonia, Streetsboro, Northfield, Solon, Bedford, Chagrin Falls, Peninsula, Stow, Mantua, Kent, Maple Heights, Munroe Falls, Novelty, Cuyahoga Falls, Bath, Garfield Heights, Mentor, Richfield, Beachwood, Akron, Ravenna, Tallmadge, Broadview Heights, Hiram, Cleveland Heights, Mayfield Heights, Medina.